Preface. Models of the Economy as a Whole. What is a model? A Macroeconomic model - a new approach. Another accounting system, input-output (I-O). Yet another accounting system, flow-of-funds (F/F). Models of the Centrally Planned and Transition Economies. The basic framework. Demand determined models. Supply determined systems: the supply side. Fully supply determined systems. Quasi-supply determined systems. Disequilibrium macromodels. The use of macroeconometric models. Major Topics in Macromodelling. Final and intermediate demand functions. Supply determination. Production functions and production potential. Price and wage equations. Financial flows. Project Link. The LINK Matrix. The LINK algorithm. Some LINK applications. New directions for LINK. Simulation. Formulas of simulation. The Gauss-Seidel algorithm: linear case. The Gauss-Seidel algorithm: nonlinear case. The Newton method. Stochastic simulation. Model Validation. Sources of error. Descriptive measures of error. Analytical measures of error. Some limits to accuracy. Dynamic Analysis. A theory of economic fluctuations. Some sinusoidal limit theorems for econometric models. Otsuki's sinusoidal limit theorem. Measurement - the spectral approach to the frequency domain. Measurement - an autoregressive approach in the time domain. Some interpretations of economic dynamics. New directions in time series analysis. VAR models. Stationarity and non-stationarity. Equilibrium relationships and cointegration analysis. Rational expectations. Multiplier and Policy Analysis. Multipliers. Some multiplier tabulations and policy simulations. Optimal economic policy. Forecasting. Ex ante prediction. Forecast preparation. The forecast horizon. Combinations of high and low frequency forecasts. Ex ante forecast error. Two important new developments have occurred that have significant impact on the evolution of econometrics, namely, the end of the Cold War and the emergence of the information revolution in nearly all economies of the world. The information revolution has had significant effect on data flows, making them much more timely, accessible, and descriptive of more parts of the economy. At the same time, it has changed the industrial structure of many economies, giving rise to increasing importance of the tertiary sectors (e.g. services). The new generation of hardware and software enables econometricians to handle larger and more complex problems, especially those that are data intensive and computer intrusive. These major events require reconsideration and redrafting of some of the materials of the original edition. The present volume retains the original structure of "Lectures on Microeconomic Theory" and takes up principles of constructing dynamic macroeconometric models and their use in economic analyses and forecasting, while introducing many updates, revisions and extensions. 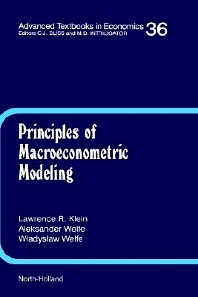 The description of the econometric methodology has been limited to specific applications of time series analysis, and the title has been changed to "Principles of Macroeconometric Modeling". The first four chapters discuss the principles of specifying equations of structural macromodels, covering both developed marked economies, transition economies and world-wide models. The remaining chapters cover some major issues in the use of macromodels. The point of departure is model simulation, especially of the prevailing non-linear models, which is followed by model validation. The analysis of model dynamics covers economic fluctuations and the relevant implications of non-stationarity. The use of macromodels in policy analysis is presented next; it includes multiplier analysis and scenario simulations. The monograph ends up with forecasting being a special case of simulation analysis.